April 22, 2019 - NEXT WEEK'S AUDITIONS TODAY! 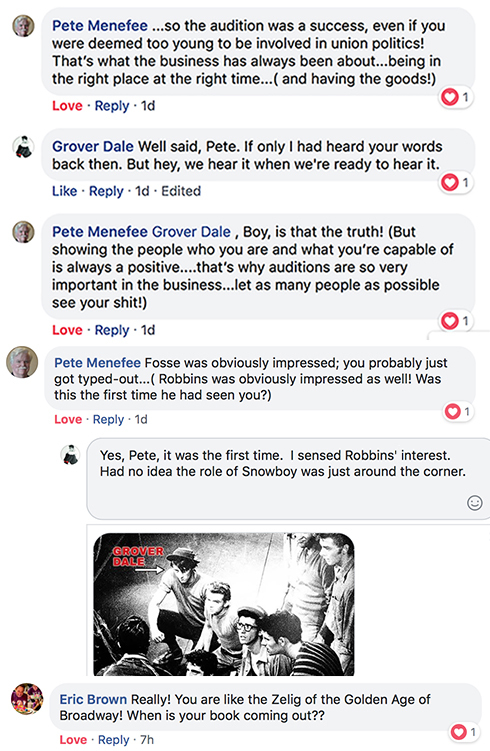 ‘FOSSE/VERDON’ - WHAT REALLY WENT ON? GROVER DALE KNOWS! The new FX series Fosse/Verdon is the most exciting show about dance since Glee hit the air ten years ago. Only this series is about real life and we have an intimate view of a time when dance was revolutionized by a visionary choreographer. It’s great watching the stories unfold, but how amazing would it be to hear some of the history directly from the people who were there? Well, we’re in luck since we know someone who was actually there… A4D's founder, Grover Dale! MY FIRST BROADWAY AUDITION & BOB FOSSE. It's 1953. Producers of 'The Pajama Game' are betting on a new choreographer. Rumor has it, they were dazzled by a two-minute routine that BOB FOSSE staged for Carol Haney and himself in the movie ‘Kiss Me Kate.’ Truth is, they were steered towards Fosse by another choreographer (Jerome Robbins). The turnout for the open call was humongous. So was the wait getting in the door. I showed up thinking all that’s needed is a bright smile and as much youthful energy as I could muster. Four hours later, I found out differently. I was one of twenty dancers kept for a final Q&A with Fosse. Fosse gave me a clue I should've listen to. Adapting to a specific age range is part of every performer’s responsibility...but hey, I just got off the bus twelve weeks ago. What did I know about adaptability? Making it down to the last ten was all I could focus on. Fosse and Robbins picked eight. I wasn’t one of them. The Broadway revival of West Side Story is continuing its nationwide search to fill the roles of Maria and Anita. THERE'S STILL TIME TO SIGN UP FOR THIS WORKSHOP! Can't be there for the workshop but would like to support this project, you can donate online here. 53 NEW DANCE AUDITIONS ADDED TO ANSWERS4DANCERS.COM! Earth Day is here so join the race to make the world a better place! And while you’re at it, check out 53 fossil fuel free posts that were added to the Auditions Calendar just this week. States lead the way with 18, followed by NYC with 15, International has 11, and LA has 3. Dance Companies offer 9 additional opportunities for dancers. Members have access to all these auditions along with complete details, while non-members have 2 free postings available on A4D's Free Auditions page at www.answers4dancers.com. Irving Berlin’s White Christmas seeking Equity m/f dancers who sing very well for ensemble, characters are early 20s to mid 30s, major tap skills and equally strong in ballroom and theatre jazz, ladies bring character shoes with heel and tap shoes with heel, wear a dance skirt or tap shorts, men jazz/character shoes and tap shoes, wear slacks and a button-down or polo shirt, prepare a traditional musical theatre song, Berlin, Gershwin, Porter, and Kern only, choreography by Randy Skinner, Contract: SETA Short Engagement Touring Cat. 1; $1,012/wk. 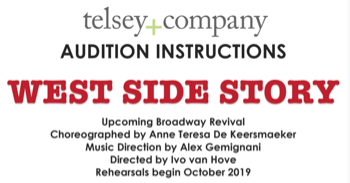 West Side Story Seeking Submissions for Broadway revival for nationwide search for actors to fill the roles of Maria 18, Latina who is a classical soprano and Anita 20s, Latina who is a strong dancer, directed by Ivo van Hove, choreography by Anne Teresa de Keersmaeker, the production is seeking actors who authentically identify as Latina for the roles, guidelines for submission videos can be found on the Auditions Calendar under the Auditions By Submission listings. Monopoly The Musical seeking m/f strong dancers who are very strong singers and comedic actors for ensemble, 20s to 30s, all should bring both jazz and tap shoes, prepare a short comedic song from any time period that shows off your voice, choreography by Donna Feore, Contract: Development Agreement Tier 2 $900/wk. West Side Story Seeking Submissions for Broadway revival, nationwide search for actors to fill the roles of Maria 18, Latina who is a classical soprano, and Anita 20s, Latina who is a strong dancer, directed by Ivo van Hove, choreography by Anne Teresa de Keersmaeker, the production is seeking actors who authentically identify as Latina for the roles, guidelines for submission videos can be found on the Auditions Calendar under the Auditions By Submission listings. West Side Story seeking m/f dancers who sing or singers who move well for all roles plus ensemble, all Sharks, Jets, Shark Girls and Jet Girls and Anita need to be strong dancers/movers, all ethnicities, prepare a one minute musical theatre selection in style of the show, no pop or a cappella, Equity members can schedule appointment in advance of auditions, choreography by Karl Warden, Contract: Equity LOA/LORT $612/wk. La Gondola Rossa seeking m/f identifying dancers for summer season to work in several amusement parks in Asia, seeking male identifying applications, 18 to 35, Caucasian and Polynesian dancers, submit materials online including reel and recent photographs. Disney Parks Live Entertainment in Orlando, Florida seeking m/f dancers with great technique and hip-hop skills, acting a plus for Hocus Pocus Villain Spelltacular, performed at the Magic Kingdom® Park at the Walt Disney World® Resort, arrive warmed up and ready to begin at call time, be sure to wear form fitting attire to show silhouette, create ‘My Profile’ online, Contract: Disneyworld minimum $17.08/hr. Annie in Chicago, Illinois auditions for Fireside Theatre in Fort Atkinson, Wisconsin, seeking m/f very strong dancers who sing and act well, all ethnicities, some ensemble members will cover principal roles, arrive warmed up and ready to dance when call begins, bring character shoes, prepare 16 bars of music; singing from the show is fine, Contract: Dinner Theatre Fireside Dinner Theatre Agreement $682/wk. For complete details on all these auditions and access to plenty more opportunities, visit the Member Audition Pages at www.answers4dancers.com.